… the most successful German U-boat of the Great War had stealthily left Welsh waters and returned to base, leaving behind it a trail of sunken and damaged vessels circling the UK. 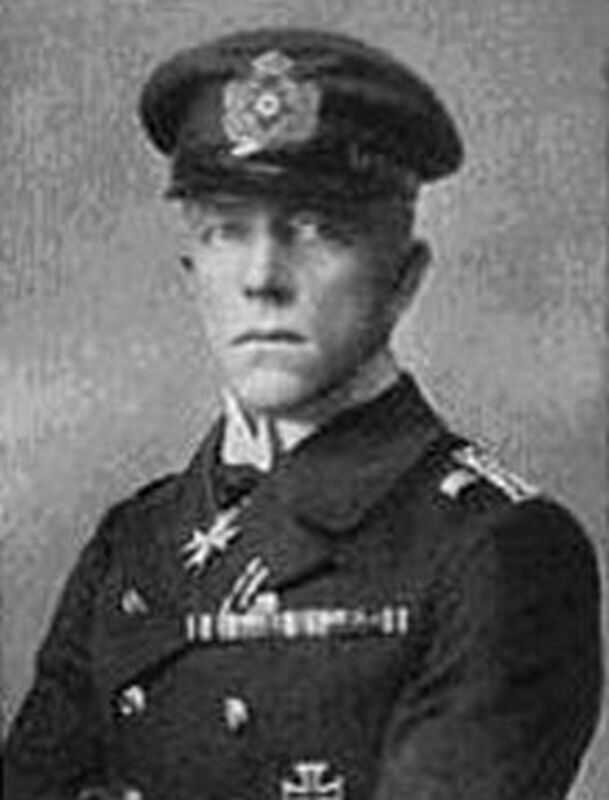 U-35 was commissioned on 3 November 1914 and given over to the command of Kapitänleutnant Waldemar Kophamel. During the Great War, the submarine undertook 17 patrols around the UK and in the Mediterranean, sinking 226 ships and damaging nine others. Its first patrol, which caused the trail of destruction, appears to have begun in late April or early March 1915. On 9 March 1915, the BLACKWOOD, a British steamship owned by Tyneside Line Ltd. (J. Ridley & Son & Tully) of North Shields, became the U35’s first victim. The steamship was carrying coal from Blyth to Le Havre and was torpedoed off Dungeness, Kent, in the English Channel. The route of the submarine can then be followed into the North Sea (the sinking of steamship LAILIA on 30 April 1915), and on around the north of Scotland (sinking of CUBANO steamship off the Flannan Islands, Outer Hebrides, on 2 June), until U-35 was in the Western Approaches off southern Ireland. Between 6 &13 June 1915, it would sink 12 ships flying the flags of Britain, France, Norway and Russia. The first losses in Welsh waters were on the 8 June 1915 – four in one day. The EXPRESS (NPRN 519183), a three-masted schooner, was captured and scuttled south-west of the Smalls. Next was the STRATH CARRON (NPRN 274643), a Glasgow steamship, torpedoed without warning, followed by the French schooner LA LIBERTÉ (NPRN 519181), which was shelled. Finally, the Falmouth schooner, SUSANNAH (NPRN 519182) was captured and scuttled. 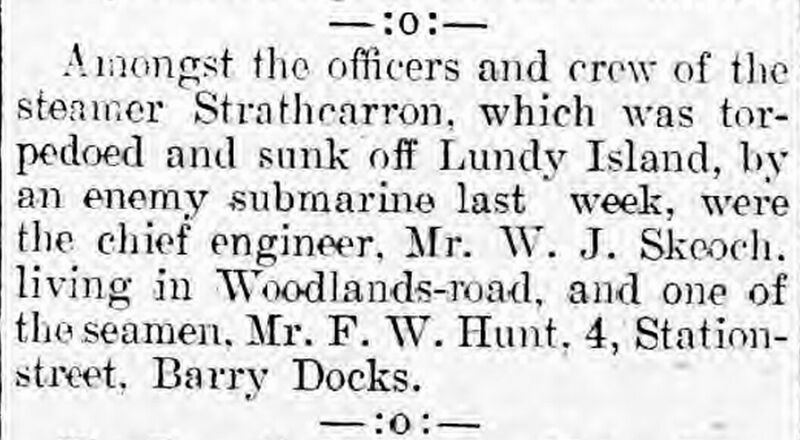 A small feature in the ‘Mrs Grundy’s Jottings’ column of the Barry Dock News, 18 June 1915, notes that two of the crew members of the STRATH CARRON were residents of Barry. U-35 moved westwards to sink three more vessels off southern Ireland, before returning to Welsh waters on 13 June 1915. Contemporary newspapers implied that the German U-boat captain had used a new infamous ‘tactic’ –- hiding behind a steamship to cover its approach to sink another vessel. The steamship was the HOPEMOUNT (NPRN 519188) of Newcastle, carrying Welsh coal from Cardiff to Alexandria. The HOPEMOUNT’s crew, while in their lifeboat, saw the submarine attack and sink an unknown schooner. The submarine then returned and again shelled the HOPEMOUNT, because it was not sinking quickly enough. The master of the unknown schooner, which was the French-registered DIAMANT (NPRN 274645) of St Malo, stated that the submarine appeared from behind a steamer, which watched the operation, and that afterwards the submarine returned to the shelter of the ship. With hindsight, from the above accounts, we can see that Kophamel was just making the most of the opportunity presented to him. Two days later, he was away to the west again, off southern Ireland, sinking the sailing barque FRANÇOIS and the full-rigged ship MORNA. From there, U-35 slipped away, back to its home base. Its next series of attacks on Allied shipping began in the Mediterranean in September 1915. Remembering those with who gave their lives for their country, and who have no grave but the sea.